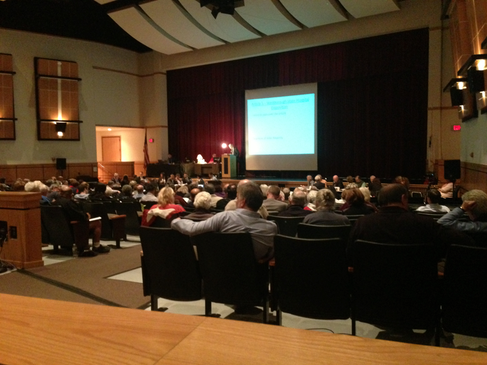 This one and only fall session of Westborough's town meeting was held at their high school 90 West Main Street�in their spacious auditorium (with very comfortable, padded seats I must say !). The meeting got started at 7PM and there was about 45 minutes of respectful debate and Q & A on the subject of whether the town should use electronic voting or not. � From first living through all this in Wayland, I had a deja-vu' moment when I heard the many supporting and dissenting comments and concerns. �(See our FAQ) �The Westborough officials certainly did their homework and I give a nod to Mr. David Bernstein (chairman ELVIS) who had visited with Westborough and shared the detailed procedures created and learned in Wayland. Westborough at about 7:45PM voted by show of hands (colored paddles) to accept electronic voting for that town meeting by about an 85% to 15% margin (as visualized by myself from the of auditorium). There was an upfront test vote which always shakes out a few handsets which are either not on (so we turn them on) or a handset of two which was not properly registered (so we replace them with registered handsets). �From there, the town meeting proceeded in a normal fashion except when it came time to vote. �The moderated opened the voting window, the light bulb went on and the town meeting set in calm silence and privacy and voted. �The light bulb turned off and the moderated called out the results. An initial 10 keypad 'audit' procedure was initiated by the moderator to get confidence. �The audit passed 100%. I left the meeting at about 9:30PM but I was later told that at 11PM Westborough considered article 28 - to accept electronic voting once again for the spring of 2014. The article passed with a 2/3rd's to 1/3rd margin. �The quantum of vote was 50%.